The Women for Africa project looks to empower African women, either widows or caretakers of AIDS orphans to generate an income by creating their own small businesses. These women receive training and the necessary tools to begin projects that will allow them the opportunity to provide a better life for the family they provide for. Micro-Enterprise has become one of the greatest ways in which families trapped in poverty can begin a new life of prosperity and happiness. Now operating in several countries, these programs allow women to take out small loans after undergoing training for accounting and basic business practices. Whether they decide to buy a sewing machine, an ox or seeds for farming, these women are able to turn a small loan into long-term benefit for their family. In most countries of Africa, the ability to take out a loan or establish credit does not exist. 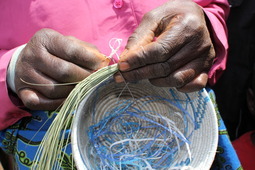 Micro-enterprise makes dreams possible by allowing these African women to draw on their potential and abilities. The success of this program has proven the idea that poverty is mostly due to a lack of opportunity not bad stewardship. Any donation of $100 can provide such a loan for an individual. A gift of $2,500 will fund a project reaching an entire network of villages and communities. This year, NCM hopes to expand projects into Zambia, Ethiopia, Uganda, and Mozambique, requiring a total of $35,000 for 100 individuals and ten community projects. Your contribution is crucially instrumental in ensuring the program’s impact for an independent future of these people for many years to come. Be sure to put ACM1627 in the Memo area. Thanks for your donation.